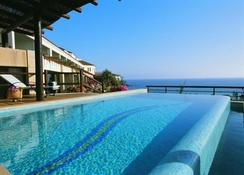 The Coral Beach Hotel resides along the beachfront, providing guests with quick and easy access to its main beach. 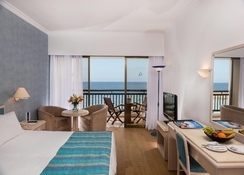 The hotel itself contains beautifully designed rooms which feature carefully balanced and delicate colours, enlarging and enriching the space, in addition to offering stunning views over the sea and Cypriot gardens. A wonderful place to visit for all the family, there’s a wide selection of activities available at Coral Beach Hotel suitable for all ages, from the on-site swimming pool, to the relaxing sauna, lively kids’ playground and Turkish baths and Spa – each just a short stroll from the hotel. There are several on-site restaurants serving International cuisine, alongside an eatery specialising in authentic Cypriot and Greek food, too. Want to explore outside the resort? There’s easy access to great attractions around Coral Bay, including amusement parks and shopping malls sure to keep younger guests entertained. 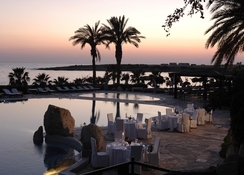 Coral Beach Hotel is located on the eastern coast of Cyprus and is easily accessible from Paphos International Airport situated approximately 28km away. The main town of Coral Beach offers myriad bars and restaurants serving both local and International cuisine and fine seafood restaurants. Local shopping can be found within a few minutes' walk, or for those seeking a faster pace, there are two lively amusement parks that can be reached by a short taxi ride. Coral Beach itself is just 50m from the hotel, but there are various other public beaches nearby. 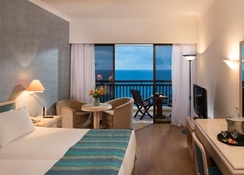 The rooms at Coral Beach hotel are comfortably spacious with different suites offering guests a variety of incredible views, whether overlooking the sea or idyllic landscaped gardens. Rooms can be found with single and double beds, some of which feature a spacious lounge area for larger families. Each of the rooms are light and airy by design, and guests will have access to amenities such as air-conditioning, television, 24/7 Wi-Fi, safe deposit box and more, to ensure a comfortable and relaxing stay. There are a few excellent restaurants on-site, including Coral, Armonia, and Calypso, each of which offer a variety of International dishes, so there’s something to suit all tastes. For something a little more authentic, try the Limani Taverna, also located on-site, which offers guests the opportunity to try local Cypriot and Greek cuisine. In addition, there are several bars which stay open until late, including a pool-side bar, ideal for quick and easy refreshments. Outside of Coral Beach Hotel, there is a fantastic selection of places to dine - Seafood lovers might want to check out Sardine Fish Restaurant. The Coral Beach Hotel offers guests both fun activities and opportunities for ultimate relaxation. If you wish to stay within the hotel resort, you can make use of the fitness centre, swimming pool, sauna and the authentic Turkish bath. There’s also a children’s playground for little ones to enjoy. Sun lovers may want to check out the sunbathing terrace, while there are several beautifully landscaped gardens, perfect for a leisurely stroll. When the beach is calling, guests can reach Coral Beach itself in just a few minutes, where you’ll also find lots of exciting watersports activities on offer. 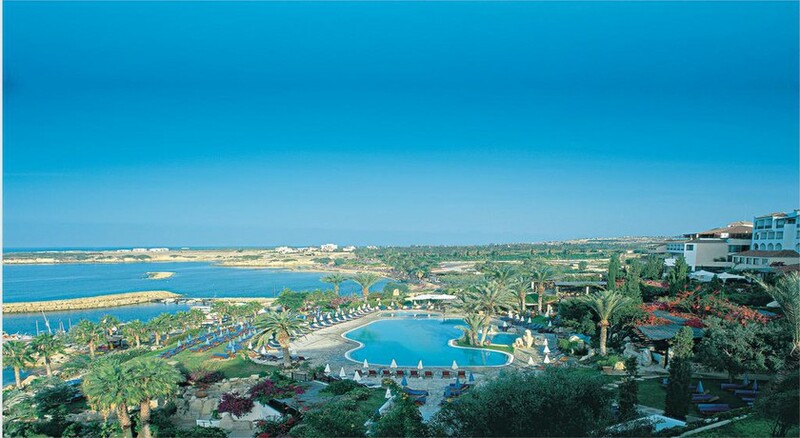 There are also great day trips to be had at Pafos Zoo and Adonis Baths, not too far from the resort. Cards accepted: ISA, EuroCard, MasterCard, American Express and Diners. Although hotel was very nice and food quite good , I paid for a side sea view room ????? Looked out onto a road and thirty foot Cyprus trees , we were moved 2 days later but had to pay 50Euros a night for the room , so don't pay extra for a side sea view as there isn't one .